2016 Ford Kuga facelift revealed at Geneva | What Car? 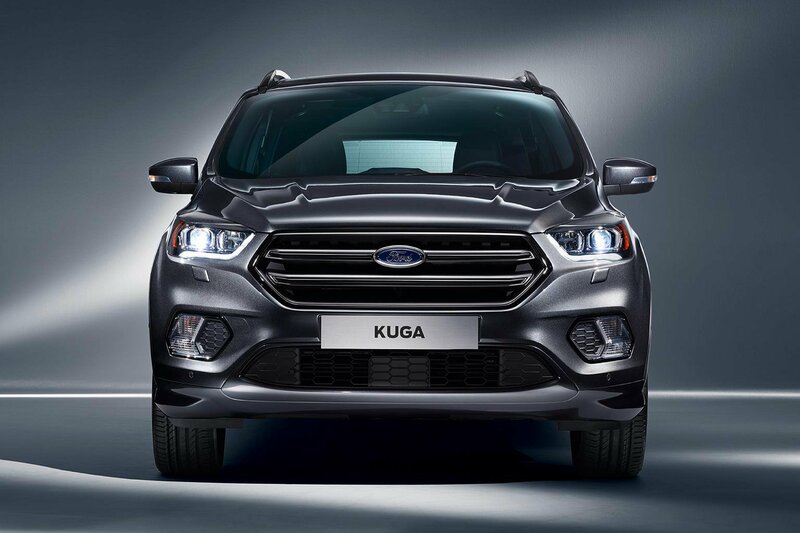 The facelifted Ford Kuga SUV has been unveiled at the Geneva motor show, and will go on sale in the UK in October. The Kuga is Ford’s mid-size SUV model, which sits in the range between the small crossover EcoSport and the larger Edge SUV. The facelift now incorporates the design language update that Ford is deploying across its range of updates, with design cues being taken from the updated EcoSport shown last year. It receives a new sculpted bonnet with a wider, more central, dome shape, which has been designed with deformability and flexibility in mind, aiding pedestrian protection in the event of an accident. What engines does it come with? A new 1.5-litre diesel engine option has been added to the range. It comes with front-wheel drive and produces 120bhp, returning a claimed fuel economy figure of 64.2mpg, while CO2 emissions are 115g/km. A 2.0-litre TDCi diesel unit is also available, with 150bhp in either front-wheel drive or all-wheel drive form, returning 60.1mpg and emitting 122g/km of CO2. There's also an 180bhp variant, with Intelligent All Wheel Drive version, delivering 54.3mpg and 135g/km of CO2. Petrol options include the 1.5-litre Ecoboost, with a choice of two outputs: 120bhp or 150bhp for front-wheel drive, with a claimed fuel economy of 45.6mpg and CO2 emissions of 143g/km. There's also an all-wheel-drive version with a 1.5-litre Ecoboost petrol engine that produces 182bhp and returns 38.2mpg and 171g/km of CO2. The Kuga now gets self-adjusting bi-xenon headlights and a new power-operated tow bar - which stores itself out of sight when not in use - as well as a new electronic parking brake and paddle shifters. The tailgate can also be opened with a kicking motion below the rear bumper. Ford’s new Sync3 technology also features inside, with an 8.0in touchscreen display including Apple CarPlay and Android Auto, allowing drivers to control functions using conversational voice commands. By saying ‘I need a coffee’ or ‘I need petrol', the system will locate nearby stops. Official pricing has yet to be revealed. However, we'd expect prices to stick fairly closely to those of the current Kuga, which costs from £19,995. AWD models offer Ford’s semi-autonomous parking technology which helps drivers park hands-free in spaces alongside other cars.